Last week God sent an abundance of jewelry orders my way. What a blessing! I took the opportunity to stock up on some sterling silver supplies for new designs. Yesterday the sterling stamping blanks arrived. I’ve been checking the mail every day for them to get here. They are beautiful, and I am absolutely thrilled to be adding some solid sterling silver layered designs to my shop. Here’s my newest design – a triple layer sterling silver necklace called Adoption Gift of Love (as always, clicking the picture will take you to that page in the shop). Oh – and I started a jewelry blog as well. 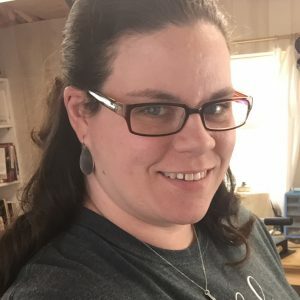 I wanted to be able to post more updates about my jewelry but didn’t want my blog here to become too inundated with jewelry posts. That blog is at http://hopeofmyheart.com/blog/. This is my newest design. It’s been a lot of fun dreaming of new designs to stamp. I’ve actually been working on quite a few new stamped pieces for the craft show, but haven’t finished them. This pendant is sterling silver and has the word Cherish stamped on it. There is room for four birthstones to hang from it. The chain is also sterling silver and is 18 inches long. It looks like there might be room for a couple more birthstones, but I have a different idea for how to handle more than four if that’s what someone needed. I just haven’t had a chance to actually try it out yet. Lately I’ve been working on some new jewelry designs. Earrings have been so much fun to make. Since it’s officially autumn now, I made some in fall colors. I posted several pictures on the Hope of My Heart Facebook page, and here are two of the new designs. This next design is one of my favorites. I just love the combination of the crystal colors and the color of the fancy jasper. My friend Stephanie wanted to see some of the designs I’ve been stamping lately. So Stephanie – here you go. This one was fun to make with all of our names on it. These two aren’t in my store yet, but some new miscarriage necklace designs are. Last week I was able to buy some new jewelry tools and supplies – things to start metal stamping. It’s something I’ve had my eye on for a while now. Here are pictures of a couple necklaces that I made. The set I ordered didn’t come with a lot of necklace supplies, but I’ve already ordered more. This is getting very addictive, very quickly. Right now it’s been fun to play around with the materials that came with the kit. 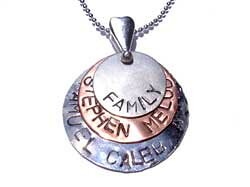 I like the copper in the necklaces above, but eventually want to stamp sterling silver as well. 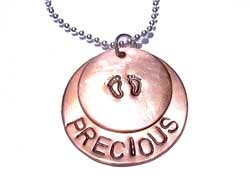 I’d love to make miscarriage memorial necklaces, and have quite a few ideas already. I thought it might get addictive (anything jewelry has that potential for me! ), but this is more so than I anticipated! I mentioned the other day that some friends of ours renewed their wedding vows last weekend. It was an honor to be able to make an earring and necklace set for my friend. It was a single strand of ivory freshwater pearls with Swarovski crystal accents. It was a lot of fun to make and an honor to give as a gift. This is my latest design – Springtime Hope. I love the butterflies and pastels in it. 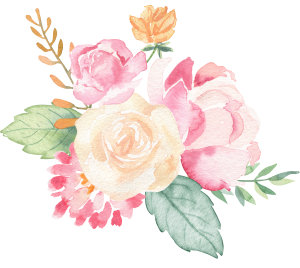 I designed it for a Virtual Spa Weekend over at the Inner Beauty Girlz blog. The Springtime Hope bracelet is a gorgeous reminder of the hope every woman can still have even while going through infertility. It has genuine Swarovski crystal beads in four pastel colors and solid white Czech druk beads. All silver used in the bracelet is solid sterling silver. The bracelet fastens with a small toggle clasp, which may vary slightly than the one shown due to availability at the time of ordering. The Springtime Hope bracelet is available in lengths of 6 to 9 inches. Several months ago, Stephen gave me some money to be able to make my own mother’s bracelet. It was a lot of fun picking out everything for it. There was some money left over, so I picked out supplies for a new watch. It’s my dressiest watch, and it gets worn quite often. Today I just finished uploading the information to sell it in my store. I realize I’m partial to it, but isn’t it pretty? I received an email this week asking me if I would design a bracelet for a woman dealing with breast cancer. October is Breast Cancer Awareness month, so I thought that was good timing. Here is what the finished bracelet looks like. It is a great time to remind women that monthly self breast exams, doctor physicals and yearly mammograms are excellent at early detection, and early detection often means a much less invasive treatment option as well as increasing the chances of remission. As always it is a good time to remember those we have lost to the disease! There have been some requests already about when the pearl earrings in the jewelry giveaway would be added to the store. This is to officially announce that the earrings have been added and are now available at Hope of My Heart Designs. The earwires and beads are solid sterling silver, and the pearls are Swarovski crystal pearls.